Hello world! 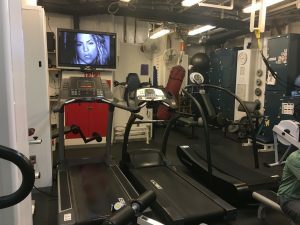 I’m back with a non-science-y, life at sea post. Common questions I get asked include things like, “Where do you sleep?” and “What do you eat?” I’m here to answer those burning questions! You can think of the JOIDES Resolution as a floating science lab + university dormitory. 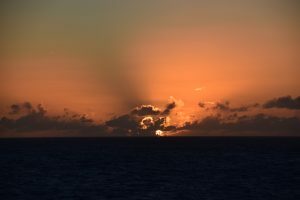 Here on Expedition 376 to Brothers Volcano, we are at sea for 56 days, and during that time, it’s really nice to have some creature comforts that we’re used to or to take our mind off the fact that we won’t be back on land for 2 months! Our accommodations are sufficient- we share a stateroom with one other person (Hi, Anna! ), but we’re not usually in the room at the same time as our roomie due to our shift times. 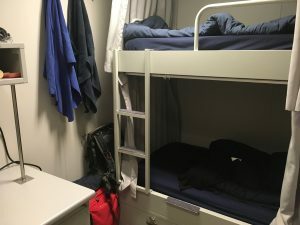 Most of the people on board work either 0000-1200, or 1200-2400, with roommates having opposite shifts of each other, so they don’t disturb the one that’s sleeping. Since I’m a teacher from the U.S., and almost all of our live ship-to-shore broadcasts take place in the middle of the night here (the East Coast of the U.S. is 16 hours behind us! ), I am working the 1800-0600 shift. That has definitely taken some time to get used to, but I think I’ve adjusted at this point. Unfortunately, I miss out on DAYLIGHT for most of the time that I’m awake, so I’m taking Vitamin D supplements, and try to head outside to catch sunset as many evenings as possible, so I can at least get a little bit of sunshine in my life! I’m a Florida girl, I need to have some sun on my skin. Sunset tonight, 21 May 2018. Our staterooms have the basics covered- bunk beds (that are surprisingly comfortable), a closet for storage, sink, and desk with shelves. We share a washroom with one other stateroom. One thing that we have on board the JR that I definitely don’t have at home is someone who makes the bed, changes the sheets, and does all my laundry! What a luxury. Most of the time that we’re on shift, we’re working, but if there’s any down time, we have some recreation options. There’s a lounge/library area, a movie room (with hundreds of movies to choose from), and a small gym on board. The gym has cardio equipment like treadmills & bikes, as well as strength training equipment. The fact that the ship is moving adds another challenging dimension to running! We NEED to hit the gym because meals on board are fantastic! There are 4 meals served daily, from 5-7 (both am and pm) and 11-1 (am and pm). There’s usually 3 entrees served at each meal, plus sides, a salad bar, bread, cheese, a dessert cooler…and fresh baked treats at 0300! So that’s the basic rundown of our life on board the JOIDES Resolution. But equally important (perhaps even MORE important) as the creature comforts are the less tangible things- like our personalities. We’ve got approximately 120 people on board, from ~15 different countries, and we all have to “put up” with each other for two months! I don’t think “put up” is quite the right word- I don’t want to merely tolerate my shipmates, I want to enjoy spending time with them and working with them. Obviously, you must possess a certain mindset before applying to a program like this. What characteristics do you think would be beneficial for someone in this situation? What would YOU bring to the table if you were here for two months? I’m curious to see your thoughts! Feel free to share below.